Bill Hirsch Auto Parts also supplies a full range of fuel tank restoration items - detergent rinse, etch, and final sealant to put life back into your fuel tank and seal the rust in the tank - not in the fuel filter or carburettor float bowl. Fuel Systems on the Links page has been enhanced to include fuel tank restoration and a link to Bill's site and email. For many years a thorn in the MG Y restorer's side has been the non-availability of the crank handle support bracket. We are pleased to advise that this situation is now rectified by Norwebb Pty Ltd of Australia, who have been added to the Suppliers Links too. 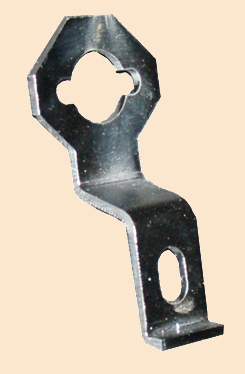 Here is a picture of their crank handle bracket. Contact Dan direct for pricing. The 2006 wall Calendar is now available for you to download. In preparation I noticed a few errors had crept into the 2005 calendar. We hope this didn't inconvenience anyone, but in case you want to, a corrected version has been updated to the site and this too can be downloaded from the Older Items section or here. Anyone who was looking for David Ransome's entry, my apologies - it has now been added - entry 154. We don't often mention the guest book (which you can sign in and leave your comments on the Welcome page, or read the entries in there), but earlier today, David Ransome, former owner/operator of the Y parts business Whyparts signed in. Having obviously enjoyed his visit he left an update for those of us who remember him and his business. David, we all wish you well and thank you for what you did to keep Ys on the road in those days. Click here to read his entry. Please welcome Richard Knight (with his third YB - one is clearly NOT enough), YB 0655 to Ys on Parade. Gary Alpern, former owner of YB 1307, sent in a new reprinted advertisement for us. While not advertising an MG Y specifically, there is a good picture of one in this advert from 1982 for Plastic Padding from Practical Classics April 1982. A new Hint and Tip has also been provided by the East Grinstead Small Works Team for converting used Y Saloon carpet strips into YT ones. Finally today, the Reprinted Article is the English translation of the French article posted at the beginning of December. In case we do not have another update before "Happy Holidays and Season's Greetings" from all of the crew here at the MG Y Register to you all. Safety fast. Please welcome Lina and Aldo Crinó, with YT 4120, and Charles Kay with YB 1215 to Ys on Parade. Andrew and Arlene have sent in details for the 12th Ripon Old Car Show. Having read the reports of such a great time being had in previous years, this is becoming an event not to miss, and this year Andrew and Arlene are planning more new and innovative things so a whole weekend of enjoyment lies ahead for attendees. See Events for details. Gary Alpern would like to know what has happened to YB 1307 as he misses it and would like to buy it back. See the Lost Ys page. Willem van der Veer started an alternate caption thread on the BBS for the Picture of the Month page. I have posted Willem's offerings and some others to the page - visit the thread on the BBS and add yours - I will periodically merge them into the page. December's Picture of the Month comes from down under and has an Eco-friendly greenness about it. Please keep sending in your pictures and stories for this feature. You can use a link on the Picture of the Month page for this. Also from Australia, Terry Ciantar shares some pictures of his very original tool kit with us. A permanent access link has also been added in the Other Items side bar to this page. We remain in France for this month's Reprinted Article. Again the English translation will be released in the middle of the month. With at least two articles in French magazines you would expect that we would have more than one French car in our Ys on Parade - where are they, there must be some more out there. If you know of a French Y Type, please encourage the owner to enter their car.